Krousar Khmer Restaurant, Siem Reap | Is Life a Recipe? I have to make a shout out for Krousar Khmer Restaurant, Siem Reap. This was the restaurant where we had lunch on Day #3 of our Siem Reap adventure, just before we went to the Tomb Raider temple. See the temple tour here. We were hot, sweaty and knackered from all the walking and exploring, so this place became our heaven-on-earth. I ordered the Cambodia Sour Soup accompanied by an icy cold Angkor beer. It was so so good, I am blogging just this dish alone, and absolutely will be re-creating it sometime soon. And here it is. Looks pretty plain and simple, but boy is this complex on the flavour front. Krousar Khmer Restaurant, Siem Reap served up a soup to me today that I could have bathed in. It was sour, sweet, spicy all in one. It was incredible. One of the very best soups ever to cross the lips of this fat bugger. The flavours hit you in bursts as the liquid moves down your tongue to your throat – pop, pop, pop!!! So folks watch this space this will be coming as a recipe to a blog near you soon. It was so amazing I just have to have a go at recreating it. If you happen to be in Siem Reap visiting the temples, specifically Tomb Raider temple, as your tuk-tuk driver to bring you to Krousar Khmer Restaurant, Siem Reap. 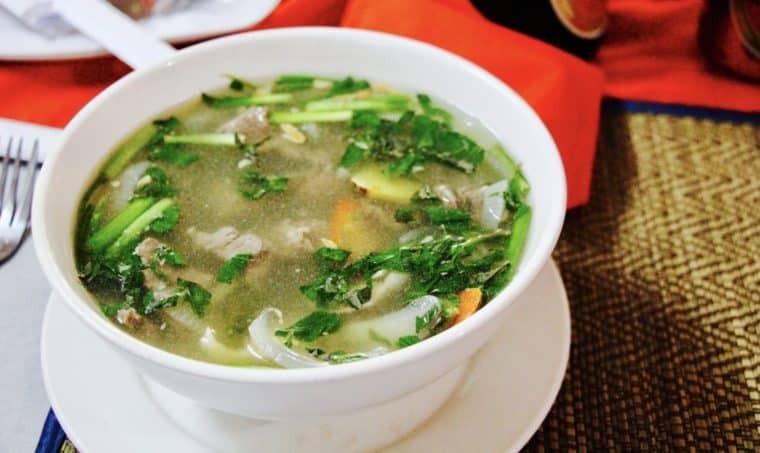 You simply have to try this soup – ENJOY!!! No Replies to "Krousar Khmer Restaurant, Siem Reap"